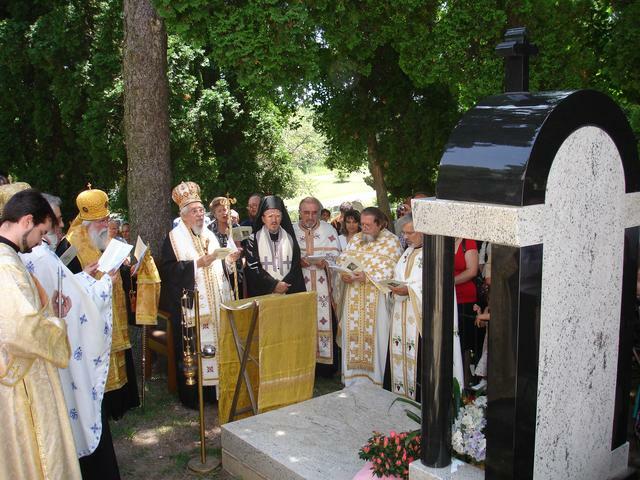 This year’s pilgrimage was the fourth consecutive one, since the canonization of Bishop Nikolai (Velimirovic) as a Saint in the Serbian Orthodox Church. With the blessing of His Eminence Metropolitan Christopher of Midwestern America the pilgrimage is held each year following the feast of the Holy Apostles Sts. Peter and Paul at St. Sava Monastery in Libertyville. This year’s pilgrimage was held on Sunday, July 15, 2007. Taking into consideration the importance of the all-Serbian event, the Divine Liturgy is not served in the parishes of the Chicago and Milwaukee deaneries, rather the priests, together with their respective flock, attend and partake in the spiritual activities dedicated to this great hierarch of the Serbian Orthodox Church. Organizers for this event were V. Rev. Dr. Milos Vesin, parish priest in Lansing and professor at the Theological Faculty in Libertyville and Fr. Radovan Jakovljevic, director of Christian Education for the Metropolitanate of Midwestern America. 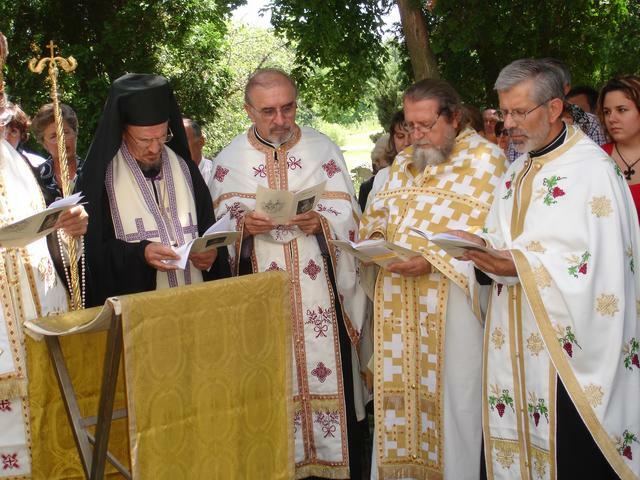 The Holy Hierarchical Divine Liturgy was served by His Eminence Metropolitan Christopher, His Eminence Archbishop Job (OCA), His Grace Bishop Longin (New Gracanica Diocese) and His Grace Bishop Dr. Mitrophan (Eastern Diocese), assisted by ten priests and two deacons. V. Rev. Milos Vesin delivered the homily at the Divine Liturgy, speaking on the evangelical theme of the healing of the two blind men. The theme of the sermon was that with sincere faith all things are possible. Prota Milos illustrated the significance of faith in our lives, using the examples from the lives of the believing people. The sermon, both in Serbian and English, had a positive affect on all those in attendance. The choir from the neighboring parish of St. Vasilije of Ostrog in Lake Forest sang the responses during the liturgy. Following the liturgy His Eminence the metropolitan noted that on this occasion diplomas were to be given to those students of the Theological Faculty who have completed their studies. At that time Metropolitan Christopher stressed that while the theological schools after WWII were closed in the homeland the theological school at St. Sava Monastery in Libertyville was the only one in operation. Bishop Nikolai, who came from the Dachau concentration camp in Germany, led the theological school and made his mark during his stay at the St. Sava Monastery. Unfortunately, continued the metropolitan, this fruitful time of the work of Bishop Nikolai was not in the latest documentary film about the bishop. This is truly not an honor to those who produced the film. Four students received their diplomas this scholastic year. The diplomas were given by professor of the Theological Faculty His Grace Bishop Dr. Mitrophan. Afterwards Metropolitan Christopher greeted the students and wished them much success in their pastoral work in the Lord’s Vineyard. The hymn “God grant you many years” was sung in honor of the students. Following the distribution of the nafora the clergy and faithful gathered before the tomb of Bishop Nikolai, where an Akathist was served to the Saint, served by four hierarchs and the celebrating priests. Once again the choir from St. Basil of Ostrog sang the responses. A lunch was served by the Federation of Serbian Sisters along with volunteers who prepared the tradition BBQ lamb in the picnic pavilion afterwards. A program followed immediately, led by V. Rev. Milos Vesin who greeted the guests and pointed out the significance of this spiritual gathering as well as the role that Bishop Nikolai played in the life of the Serbian Orthodox Church. He then introduced the speaker for this year’s pilgrimage His Grace Bishop Mitrophan. Both in English and Serbian Bishop Mitrophan spoke on the unpublished letters of Bishop Nikolai, most of them written later in his life. It was truly touching to listen to the words of this Serbian golden-mouth, who in those letters and spiritual counsels showed such love towards his people and homeland. This beautiful lecture found a special place in the hearts of the listeners. The bishop received a well deserved applause. The folklore group from St. Archangel Michael Serbian Church in Lansing, Illinois performed a medley of traditional Serbian dances, which was enjoyed by everyone. Special guests from Serbia attended this year’s pilgrimage – The Brkic Trio: Slobodan, Vera and Nada with their parents. For a number of years this trio has been performing at our churches in this country. They performed traditional and church and ethno-Serbian songs. All were amazed with the musical talents and the selection of songs. Fr. Vesin informed everyone of the situation that this trio finds itself in. By an accident of the doctor two of them were blind from birth but there is still hope that their sight will be restored. For a number of years now they have been in consultation with well known physicians in Boston and now they are traveling to San Francisco where they will begin a very complicated operation. Fr. Vesin made appealed to all Serbs to pray sincerely to God that through the medical means sight might be restored to the Brkic brother and sister. God grant it a success. At the end of the program the children’s orchestra from the St. Sava summer camp performed a few selections. It should be noted that children were arriving that day for the camp which began on that day. The program was finished at five o’clock in the afternoon, after which Vespers was served. His Eminence Metropolitan Christopher thanked all the hierarchs and clergy who took part in the service and participated in the program. He also thanked the faithful people who took part in this significant annual pilgrimage. The parishes that organized buses for transportation as well as the choir from the St. Basil of Ostrog should also be mentioned. 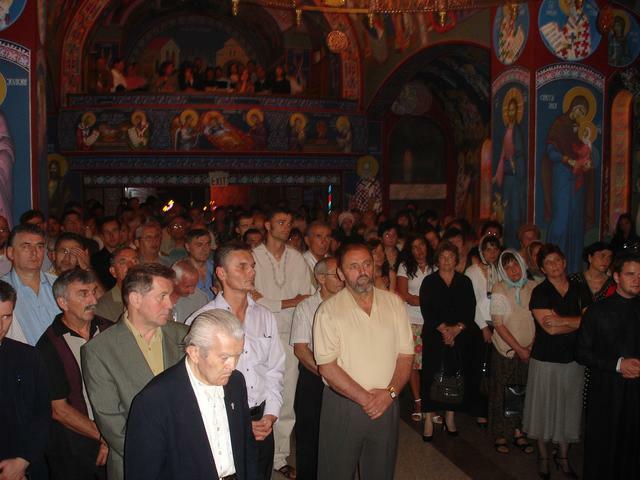 Parishes from the Chicago and Milwaukee deaneries, as well as throughout the territory of not only the Metropolitanate but the entire Serbian Orthodox Church in the US and Canada are asked to stress the significance of the pilgrimage to St. Nikolai, that the number of participants might be greater by tenfold in the years to come. The faithful from the New Gracanica diocese are also asked to take part in this significant all-Serbian spiritual manifestation. 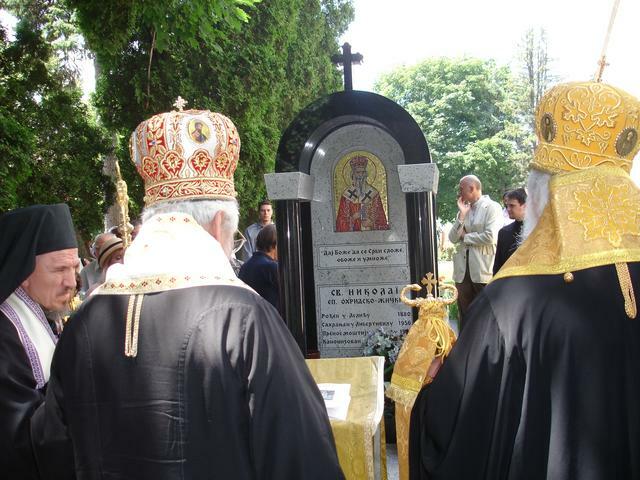 Holy Bishop Nikolai pray to God for our Serbian people.